Family comfort food to the max. Happy Thanksgiving to all of my friends across the border! 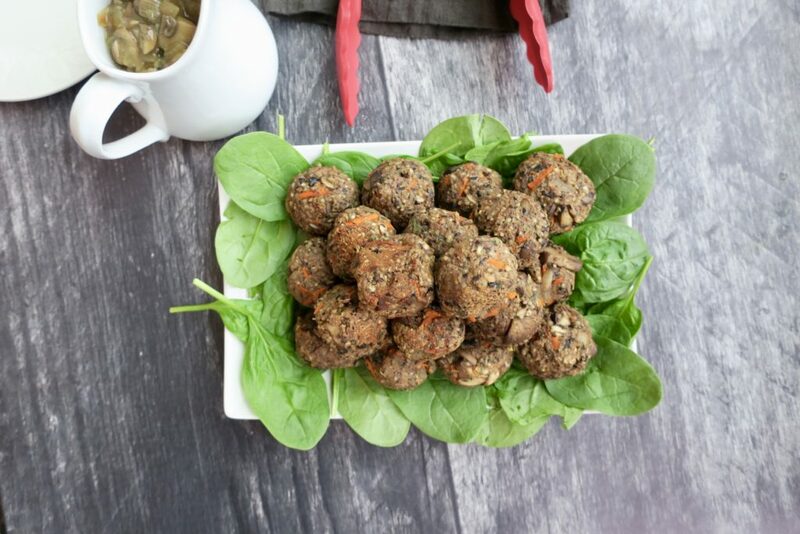 I bring to you… meatless balls! They taste better than they sound. 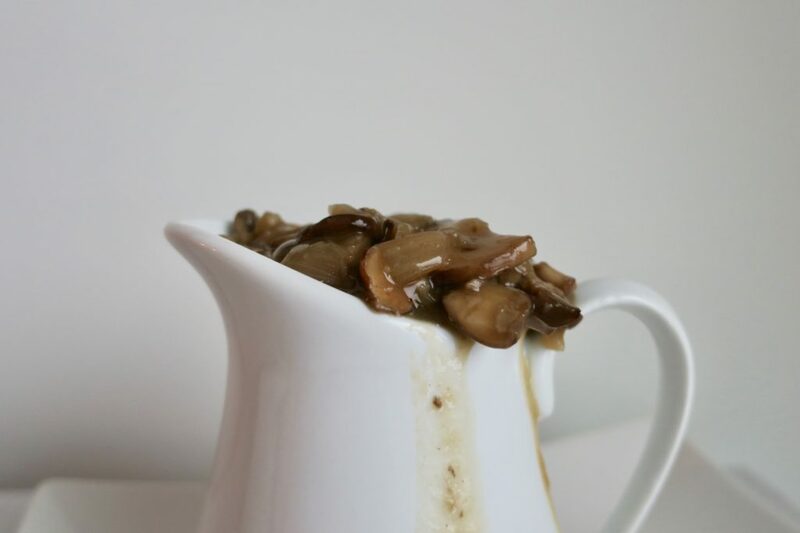 And this mushroom gravy? Well, it’s only 6 ingredients, with no oil, and mega flava flave! 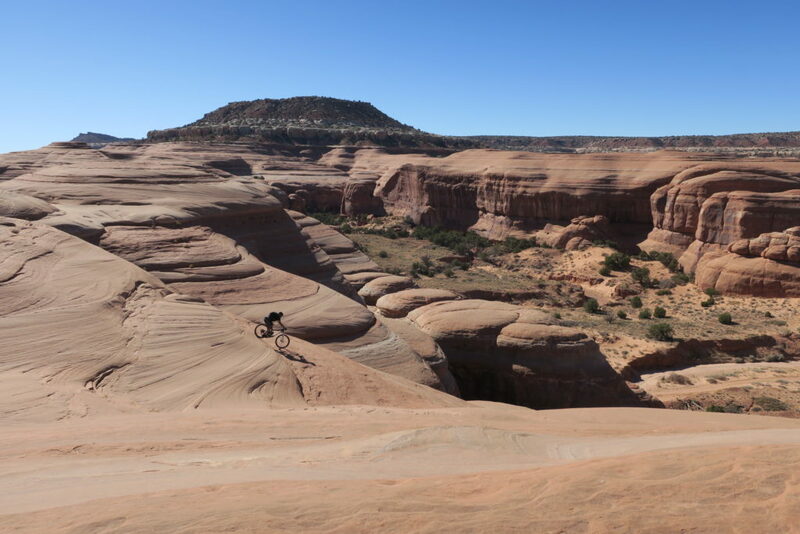 If you’re a fan of Thanksgiving, but want to skip the Turkey this year… this one’s for you! And now you have this recipe to replace the Turkey! The awesome, animal-free dinner is now COMPLETE. 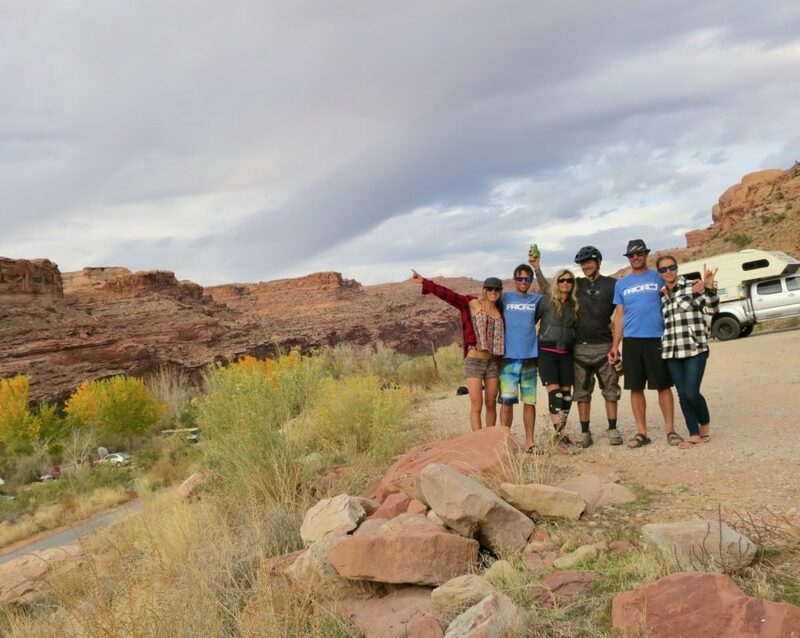 I feel the need to give my American friends a yummy recipe for this year’s Holiday because we just spent 2 weeks on a 6500KM mountain biking road trip all across the US. 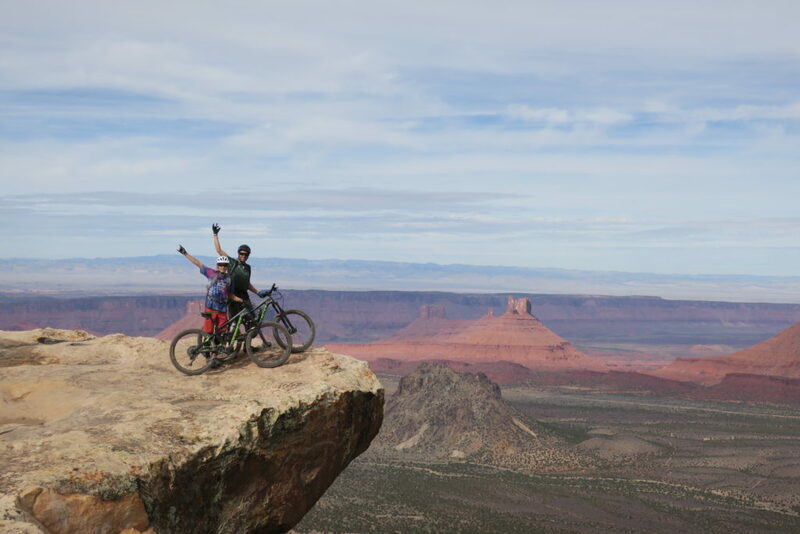 It was us, our camper, a couple mountain bikes, friends and epic views. 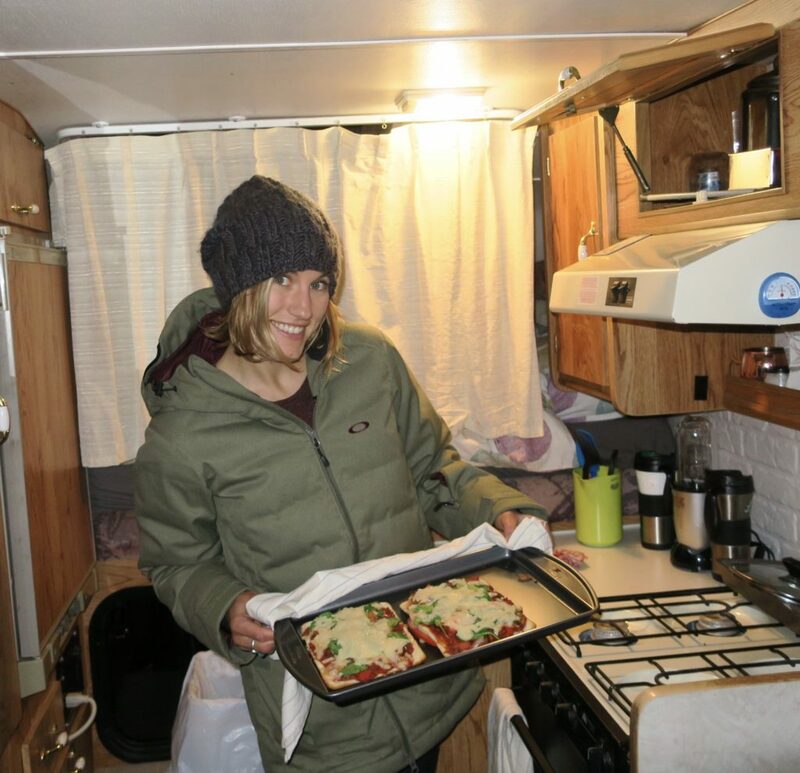 Scroll down to the bottom for some photos of the trip that was packed with camper cooking, trail snackin’, 7 hour biking adventures, and crazy landscapes. As fun as it was, it’s always nice to come home. I’m grateful for the adventuring, but also so grateful for the simple, everyday things at home. What are you grateful for? Focusing on the little things and practicing gratitude is something I feel I do naturally, but over the last couple years I’ve been trying to focus on it even more. Every morning before getting out of bed I tell myself 3 things I’m grateful for. It sets the day off to a damn good start. After that, you’ll always wake up on the right side of the bed. OK, back to the recipe!! 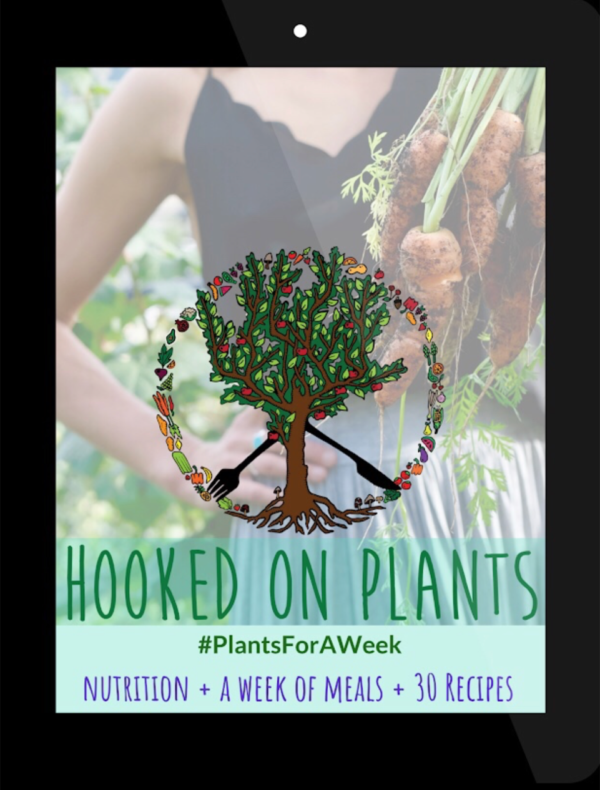 This one is inspired by the Rouxbe Cooking School Plant-Based class I finished in the spring. 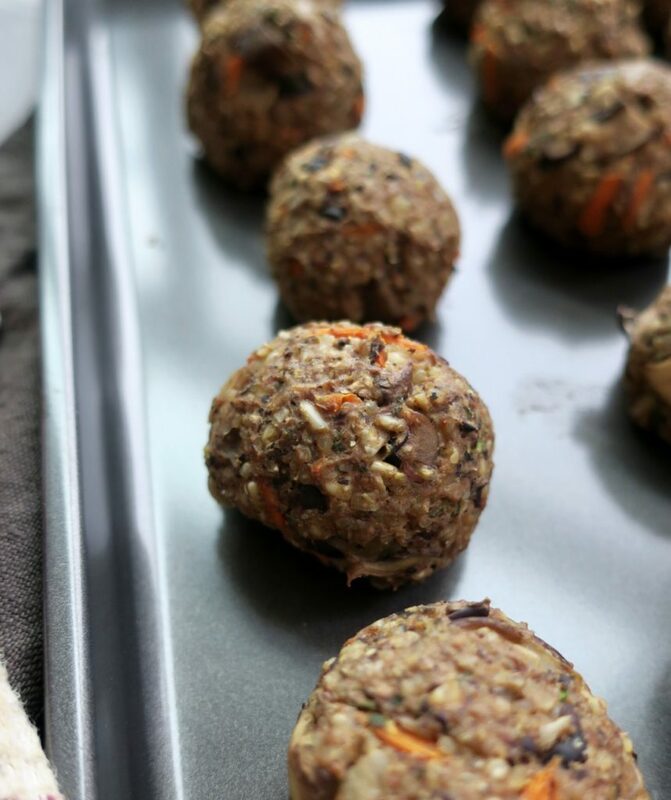 They made a loaf, but today… we make balls!! 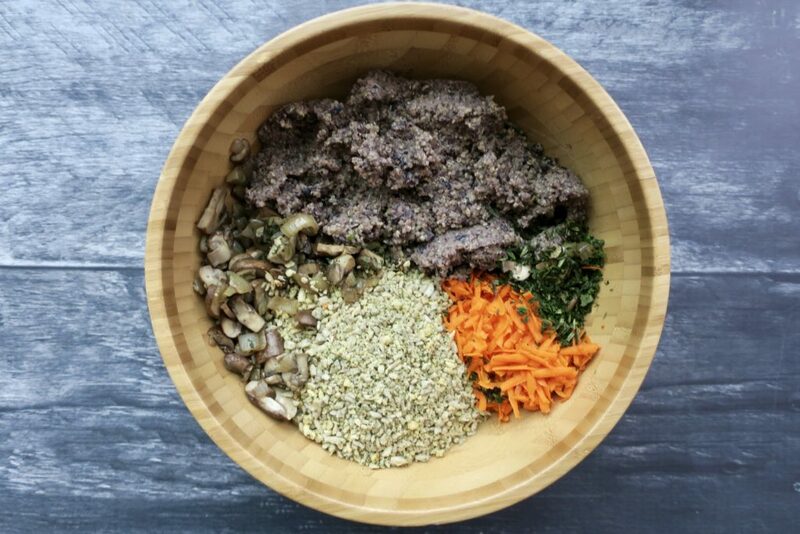 Quinoa is packed with antioxidants, essential minerals (especially iron), vitamins, and fibre (for smooth digestion and weight loss). 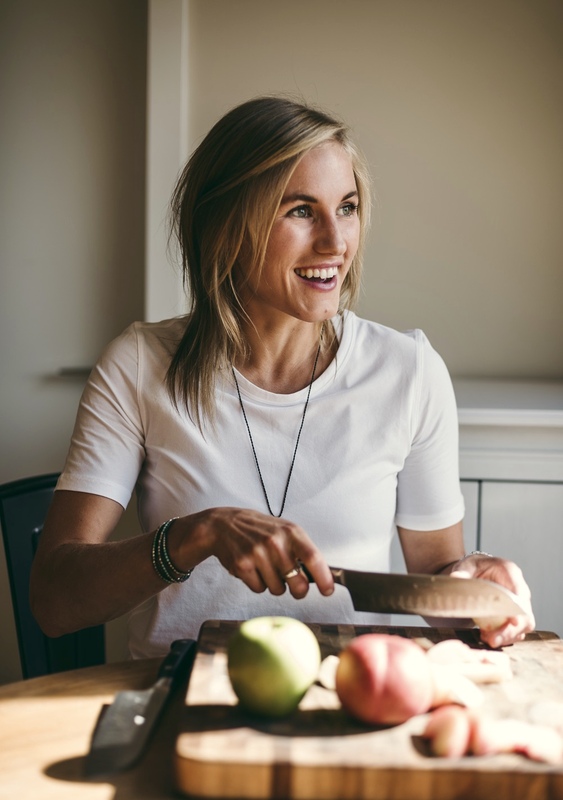 It’s one of the most protein rich foods we can eat! 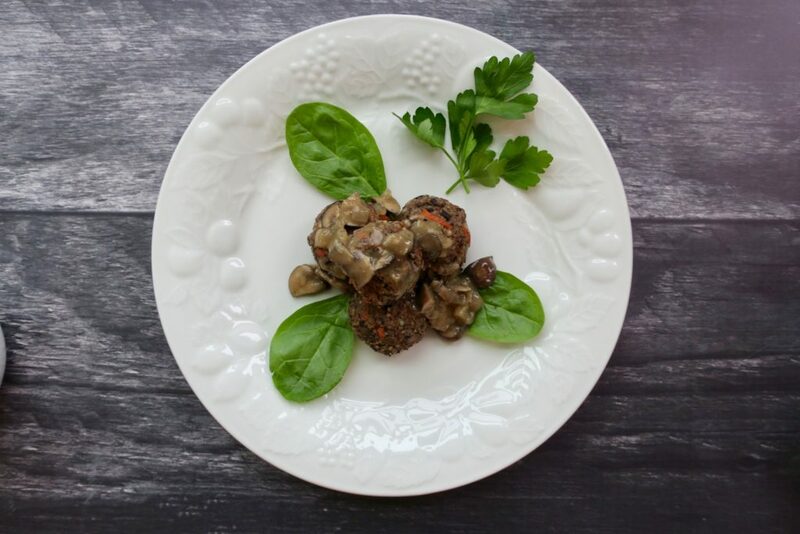 Mushrooms are packed with vitamin D, so they’re great to eat during the winter months. A good amount of vitamin D wards off depression and keeps your bones healthy, too. 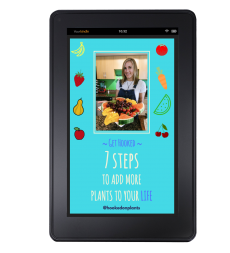 Black beans are stars when it comes to heart health because they’re packed with folate, fibre, potassium, B6 and phytonutrients. 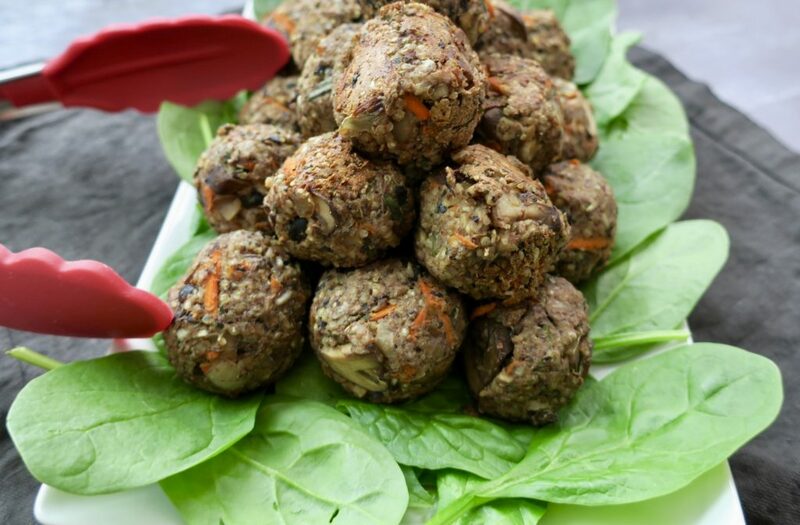 A recipe to replace the Turkey space on your plate. 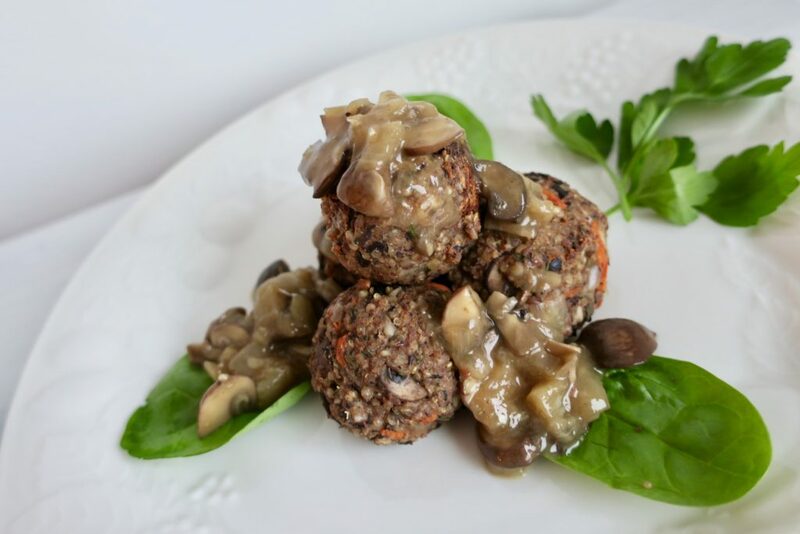 These meatless balls are flavourful and meaty, and the mushroom gravy takes it to the next level. Next, heat a frying pan over medium heat, add onions. Let cook for a few minutes, or until they become soft and translucent. If they stick, add a splash of water. Add the mushrooms and garlic. 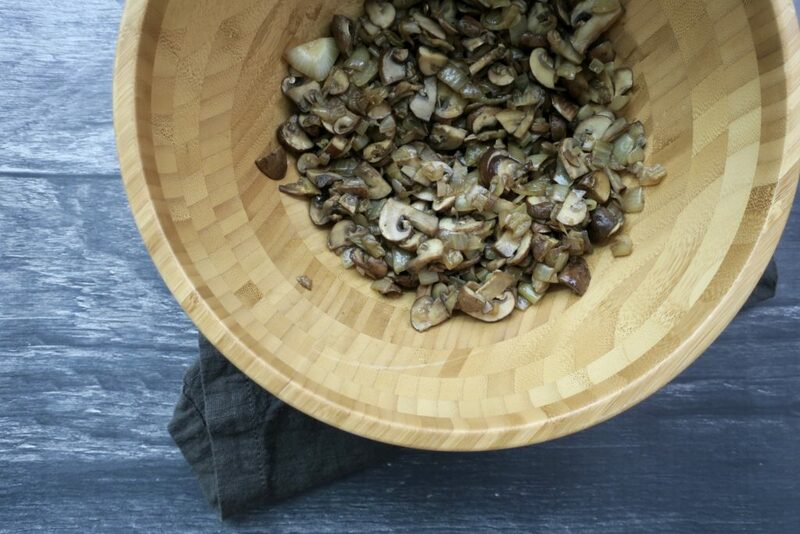 Continue to cook until the mushrooms have browned and all of their moisture has evaporated. Place onion, mushroom mixture into a big mixing bowl. Add grated carrot to mixing bowl. In your food processor, pulse the walnuts and sunflower seeds until a coarse meal forms, then add this to mixing bowl. 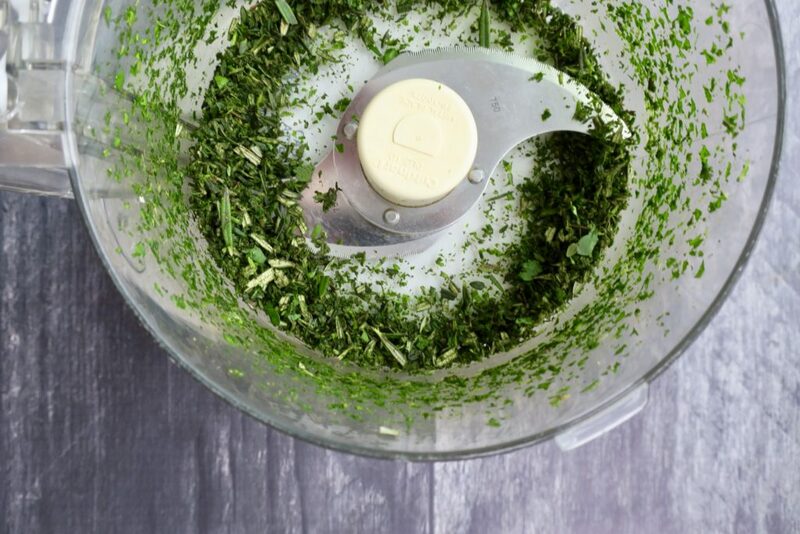 Add all your fresh herbs to the food processor and blend until minced. Add to the mixing bowl. Add the cooked quinoa and black beans and pulse a few times (still should have some chunky texture to the beans). Add this to the mixing bowl. Pour the soaked flax egg into the food processor and purée for a minute. This will create an egg-white texture. Add this to the mixing bowl. Next, add the nutritional yeast, salt, and pepper to the mixing bowl and mix everything well to combine. 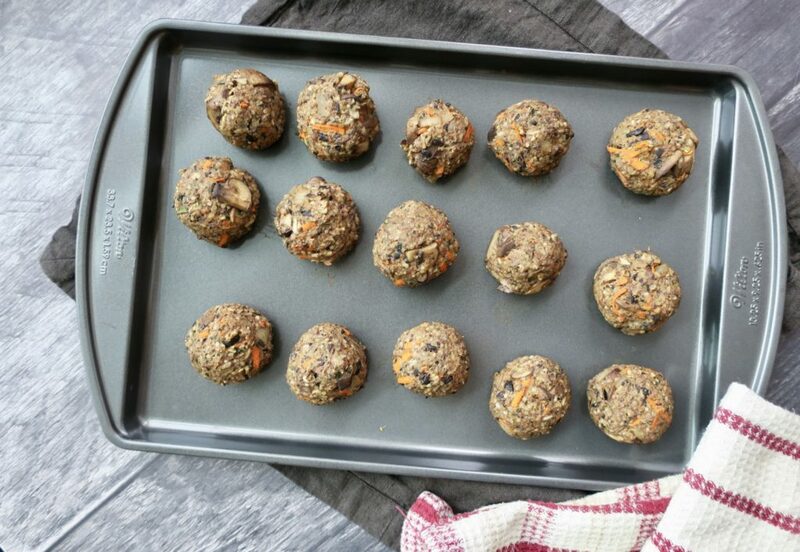 Form ½ cup balls with your hands, and place on a parchment covered baking sheet. Meanwhile, make the mushroom gravy. This gravy is good to douse anything with! It's easy, delicious and perfect for any holiday meal. Dry-sauté the onions: When the pan is hot, add the onions. Let them simmer for a couple minutes, then add a splash of water to pull the caramelization off the pan. Sauté the onions until they are translucent and slightly browned, adding more splashes of water if they're sticking. Add the mushrooms. Simmer them until their water evaporates and they start to brown. Deglaze the pan with the white wine, stirring until combined. Then, add the flour. Stir until combined and simmer for 30 seconds. Slowly add 2 cups of the water. Stir constantly, then let it come to a simmer before adding the rest of the water. Let cook a few minutes to become a gravy-like consistency, then add the tamari and apple cider vinegar. Moments from the mega road trip! I’m unable to eat beans, lentils, chickpeas, and peanuts, which is seriously hampering my ability to eat vegetarian/partially vegan! It’s a difficult question, I’m sure, but do you have any recommendations for what I could use as a substitute for the beans in this recipe? Would potato or yams work? Yams would be delicious! They would have a similar texture too! I made these over the holidays and they turned out amazing!! We didn’t miss the meat at all at our Christmas dinner. 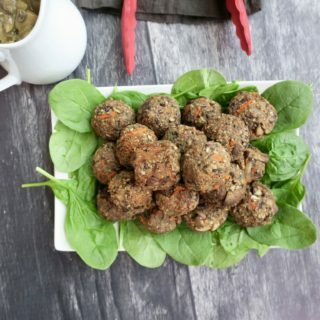 I made my balls a little smaller then suggested and used a 1/4cup measuring cup as a guide. And the gravy…..oh the gravy!!!! 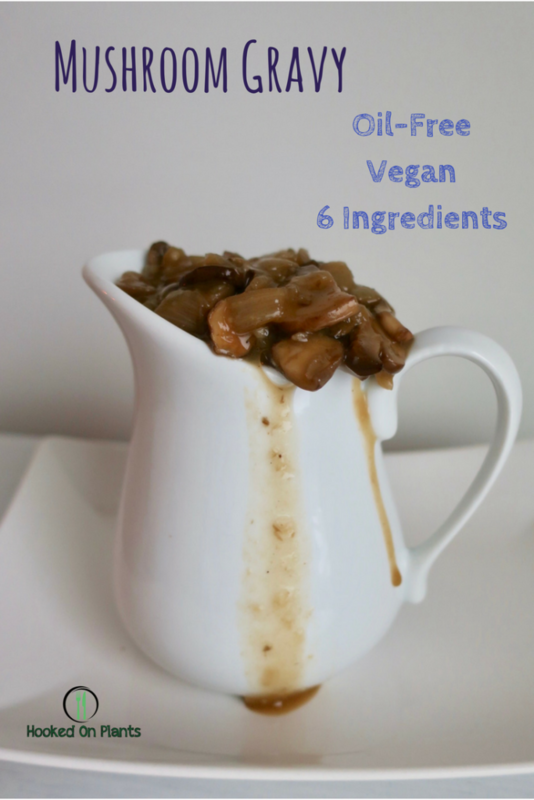 It was the best vegan gravy I’ve ever tasted!! I’ll definitely be making again!! Awesome Kelly!! 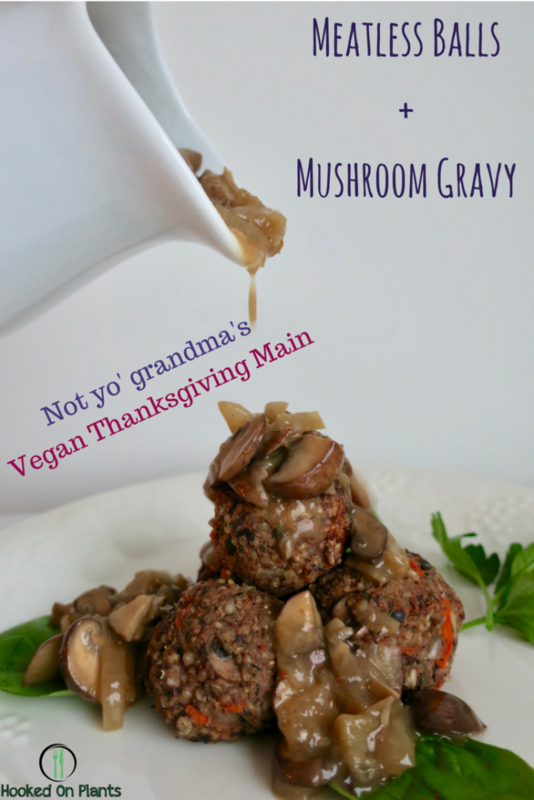 The gravy is soooo good right! ?